Fast food employees and other minimum wage workers in hundreds of cities went on strike Tuesday morning in what organizers said would be the biggest strike yet for a $15 wage. Organizers said strikes are planned for 270 cities exactly one year before the next presidential election. Fast food chains McDonald's, Burger King, Wendy's and KFC were among the companies targeted for strikes, while home care and child care workers were also striking. Social media was blanketed with pictures and videos from protests around the country Tuesday. "We work! We sweat! Put $15 on our check!" said a tweet from @Fight For 15 Mass, a Boston group organizing protests outside a McDonald's there. A spokesperson for McDonald's (MCD) said the company is aware of only two McDonald's employees who were participating in the protests. "These aren't strikes, they are staged events," said spokesperson Lisa McComb. But a photo posted on Twitter by protesters in Pittsburgh showed a sign on the door of a downtown location that read "Closed due to strike." Burger King said that it does not set wages or make other employment-related decisions for the franchisees who own and operate almost all of its locations. "We support the right to demonstrate and hope any demonstrators will respect the safety of our restaurant guests and employees," the company said. The protests drew praise from the leading Democratic presidential candidates. "Fast-food, home care, child care workers: Your advocacy is changing our country for the better," tweeted Hillary Clinton. "I stand with the thousands of workers on strike today to demand $15 and a union," Bernie Sanders tweeted. The protesters say they plan to march outside Tuesday's Republican presidential debate in Milwaukee, which is focused on economic issues. 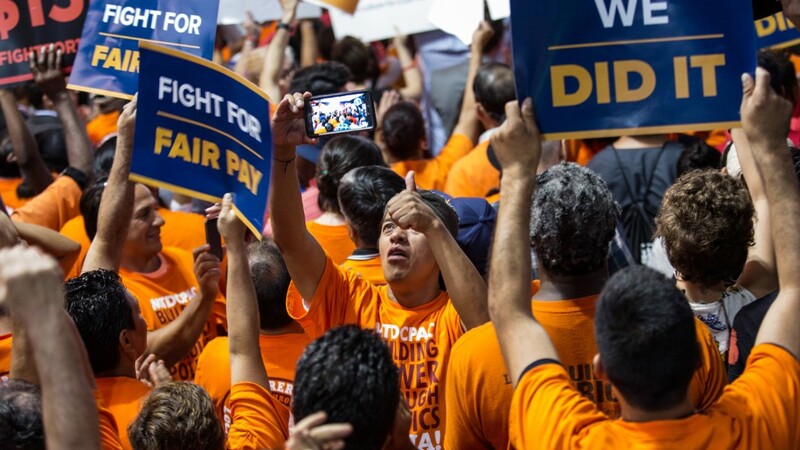 The Obama administration has been pushing for a more modest increase in the minimum wage to $10.10 an hour, but has been unable to get that through Congress. Still, many states and cities are raising the minimum wage on their own. Few have reached the $15 level sought by protesters, however the city council of Berkeley, Calif., is slated to vote on a $19 an hour minimum wage there Tuesday night. Some major retailers including TJ Maxx (TJX) and Gap (GPS) have also increased their lowest wage, although not to $15 an hour. Walmart (WMT), the nation's largest employer which has been that target of wage protests in the past, has also boosted employee pay. McDonald's hiked the wages for 90,000 workers at company-owned stores, but most McDonald's locations are owned by franchisees who set their own pay rates.